What a week it’s been! 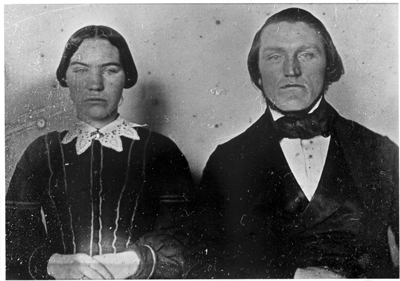 After writing the first post of this series on the death of Sever Severson, while planning my next steps for research, I was reviewing my previous research on this subject. As I was looking over some past correspondence, I noticed that I had received a message through Ancestry.com from a woman (I’ll call her A.W.) who appeared to be my third cousin, once removed. My great-great-grandmother, Ellen Caroline “Carrie” (Severson) Bailey and her great-grandmother, Cecilia M. “Celia” (Severson) Leary were sisters, and both were daughters of the man I was researching, Sever Severson. As those who’ve known me can attest, I’m generally not known as a great correspondent. My genealogical work is an exception, as I try quite hard to keep on top of my communications with family members and genealogists with whom I share common research interests. So it was with no small amount of embarrassment that I discovered that I had let a promising correspondence slip away through neglect. I’m not sure why I was so busy at that particular time two years ago (although people who know me well will tell you that I’m always busy, all the time—it’s my nature), but my response was a quick note saying I’d write back as soon as I had a moment. By the time whatever it was that I was working on had eased up, I had forgotten about A.W.’s letter. When I discovered my oversight just this past week, I wrote back to A.W. with an apology for dropping the ball. A.W. had originally written to me because my great-great-grandmother Carrie was a mystery to them, the one Severson sister that she and her family knew almost nothing about besides seeing her in a single family photo labeled as “Carrie.” I was likewise eager to learn from her about Sever, as he was a mystery to me, and I had only seen a single photo of him—the small, grayscale scan that she uploaded to Ancestry.com. I asked her if she had a higher-resolution version of this photo or any other photos of Sever that she’d be willing to share. I pointed her to the first post of this series to show her what I was working on. I may be able to contribute to your work on Sever, as I have a copy of his 1864 diary that my grandmother [_M_] had. Do you have a copy? I remember seeing the actual diary years ago when my grandmother was still living…. The copy I have is photocopies of 49 pages glued on onion skin paper…. Anyway, I’ll transcribe from my copy as best as I can and send the transcript to you, if you’re interested. It covers January 1 to September 26th, just a few days before his death. Wait—there’s a diary?!?!?!? Sever Severson kept a diary, and it’s survived a century and a half?!?!? I’m trying to squeeze what I can from what sparse documentation I’ve been able to find, just hoping to confirm some of the basic facts of his death, i.e., that he died as a Union soldier in Atlanta after the siege of that city in Summer, 1864. Given the time that had passed and the complete lack of any memories, stories, letters, photos, and artifacts concerning Sever among what has been handed down to me, I had already decided that I should aim low and keep my expectations in check; I’d quite possibly never learn much about who this man was or how he died. Then comes A.W.’s letter and the knowledge that he kept a diary! Dutifully, apparently, and daily. And for nearly his entire time in the Union Army until just four days before his death. Just knowing that the family has this treasure tells me that he didn’t just die far from home, with his family unsure of his fate. They knew, because someone cared enough to make sure this soldier’s diary made it home to his wife and children in Black Earth, Wisconsin. Will the real Sever Severson please stand up? 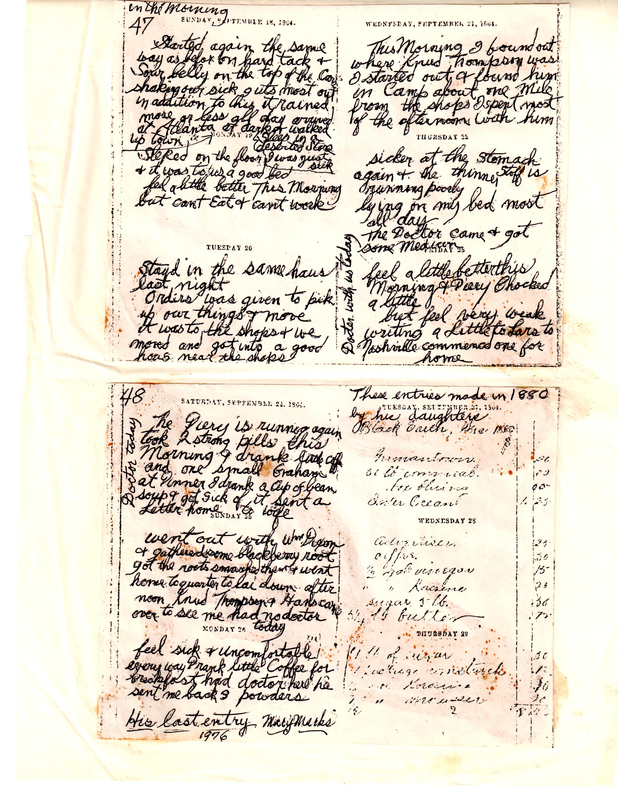 This entry was posted in 1860s, Carrie Severson, Sever Severson and tagged Civil War, Death, Diary, Illness by Michael. Bookmark the permalink.